Spring has finally arrived, although many of my friends and family are still buried under snow! Regardless of the weather, I’m craving lighter flavors and lots of fresh veggies. Anything to usher in spring, even if it’s still chilly out. This Roasted Carrot Soup is exactly what I’ve been craving, and I know you’re going to love it, too. It’s hot and comforting, yet made with sweet, fresh carrots. Healthy, yet hearty … perfect for this time of year! I don’t know about you, but I usually think about carrots as part of the meal, not the star. Something to eat dips with, or to use in the base of sauces and soups. 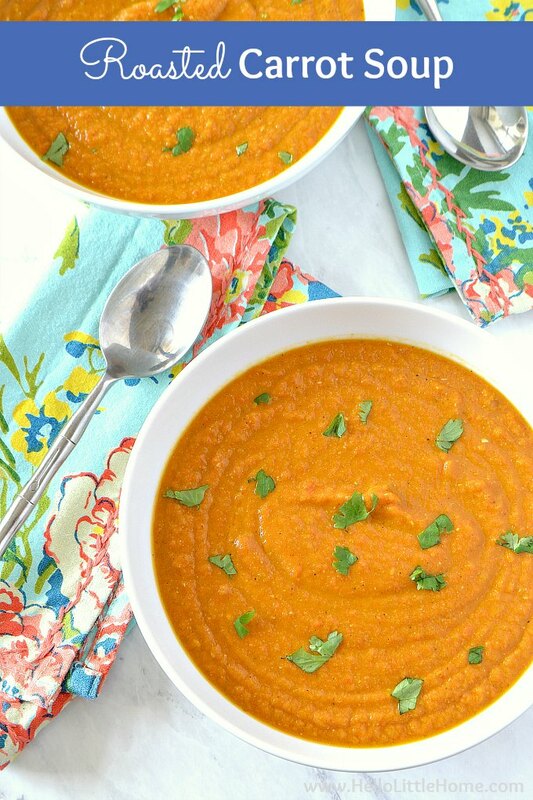 Carrots take center stage in this creamy Carrot Soup recipe, and the results couldn’t be more delicious! There are a few tricks to this soup’s success. First, roasting the carrots and onions concentrates their flavors. Next, there’s the perfect blend of spices: fresh garlic and ginger, garam masala, and cayenne. Finally, coconut milk makes this soup creamy and keeps it vegan (trust me, you won’t miss the dairy). 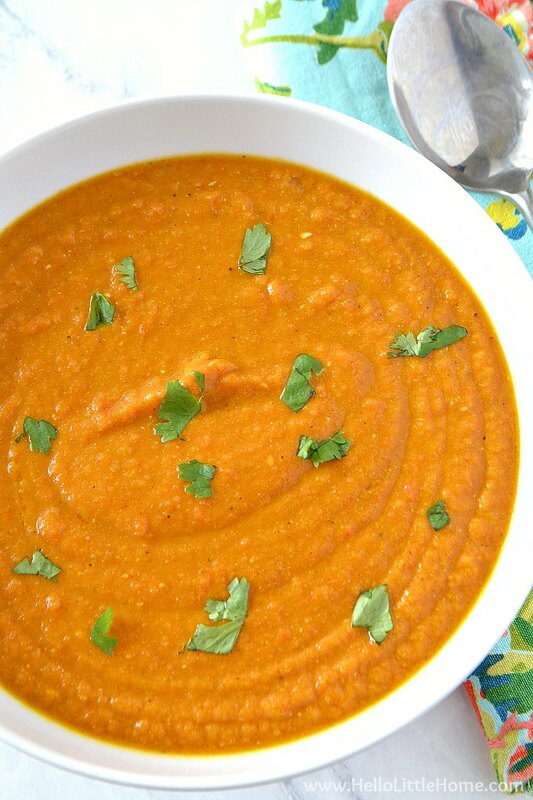 The best part is how simple this healthy Carrot Soup recipe is to make. Which means you can make it anytime a craving hits … although it would definitely be the perfect addition to a spring or Easter dinner! 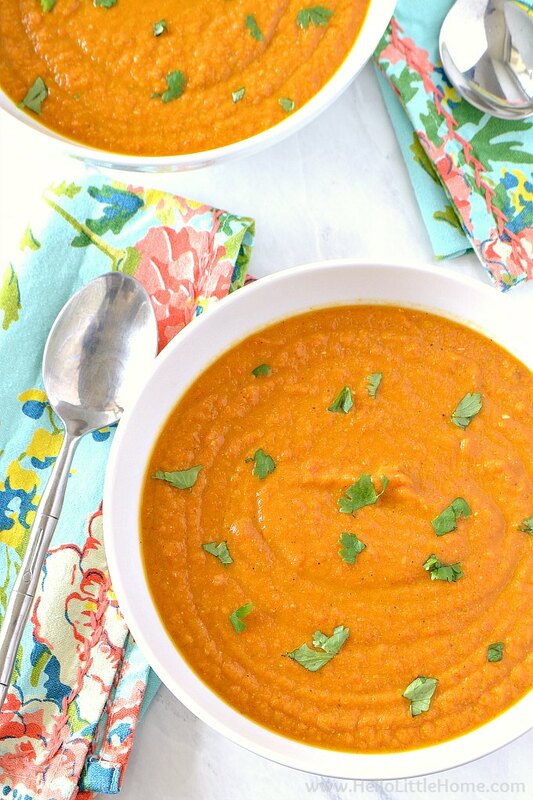 This creamy Carrot Soup really is so simple to make! Don’t be put off by the long cooking time. It’s mostly roasting time, which is totally hands off. Watch the video below to see just how easy this recipe is, then keep reading for more tips and a step-by-step recipe! The first step to making this vegan Carrot Soup is roasting the carrots and onions. It should take about 35 to 40 minutes in a hot oven. Cook the veggies until they’re lightly browned, and you can easily pierce them with a fork. Once the veggies are done cooking, you’ll saute fresh garlic and ginger, garam masala (curry powder would also work), and cayenne in a big soup pot for about a minute. Just long enough to develop those delicious flavors. This carrot and ginger soup definitely has some kick to it. If you’re not a fan of spicy foods, feel free to cut down or even eliminate the cayenne. Next, you’ll add the roasted veggies, along with some vegetable broth. Bring your soup to a boil, then remove it from heat and puree until smooth. A stick blender makes this process extremely easy. I love mine, because there is so much less cleanup than with a regular blender. You can see me using one in the video above. A regular blender also works, but you’ll need to be very careful. Make sure to work in small batches, remove the lid’s center insert, and hold a towel over the top to avoid hot soup explosions. Take your time pureeing the soup. It should be totally smooth. Return the soup to the burner, then add the coconut milk and lemon juice. Make sure to use coconut milk, not coconut cream which is sweetened. 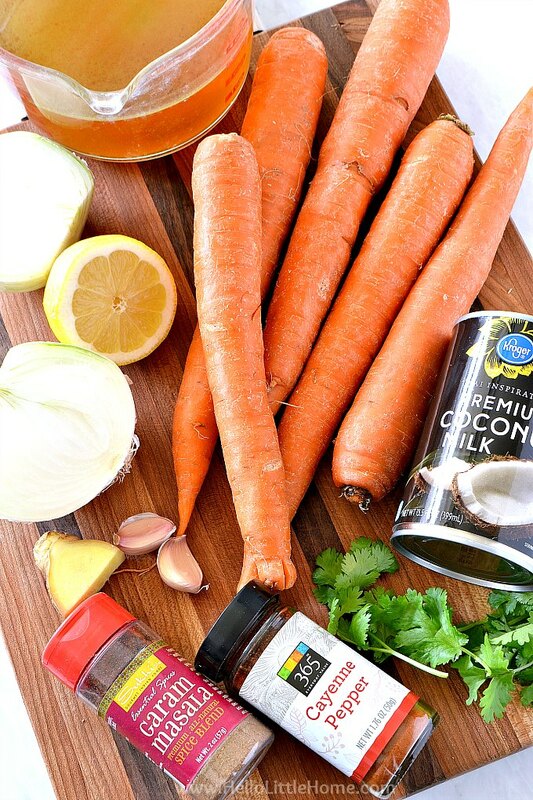 The coconut milk will make your Roasted Carrot Soup super creamy, and the lemon is going to make all those warm flavors pop. Yum! Once your soup is hot, it’s time to eat … the best part! 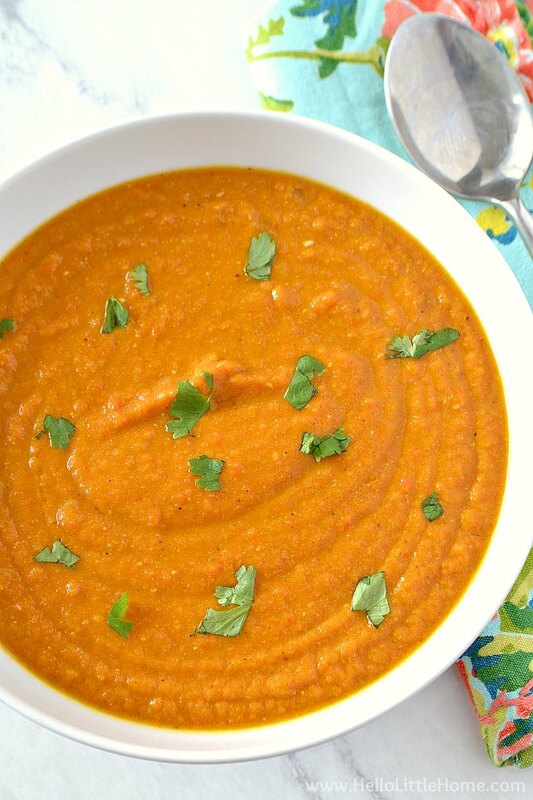 I like serving this creamy Carrot Soup sprinkled with fresh cilantro. You could also add a swirl of coconut milk … the contrast between the orange soup and white coconut milk would be so pretty. 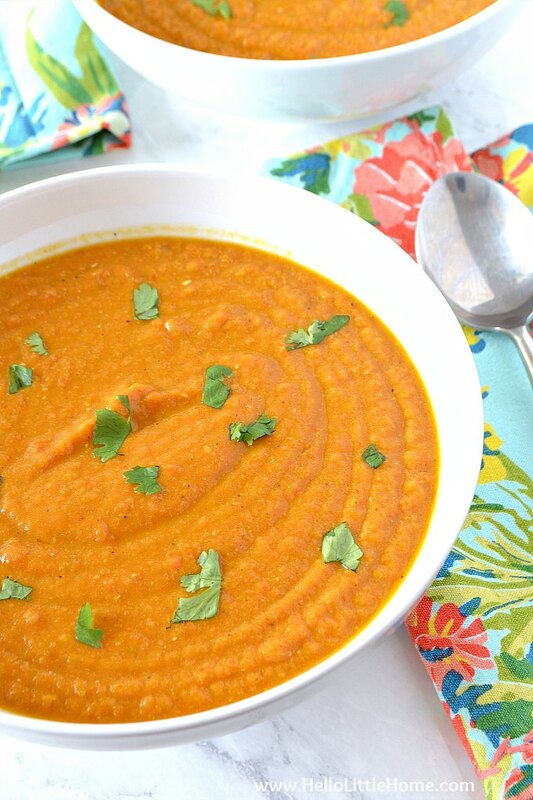 However you serve it, this Roasted Carrot Soup is sure to be a hit. Let the bold flavors brighten your spring table! 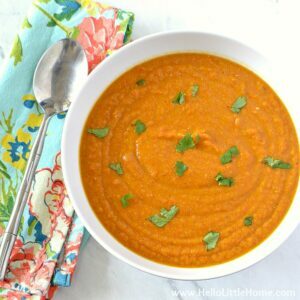 This Roasted Carrot Soup is a flavor-packed recipe that's easy to make and perfect for spring ... or any time of year! Place carrots and onions on a large baking sheet. Drizzle with 1 1/2 tablespoons olive oil, then season with salt and pepper. Mix well. Roast carrots for 20 minutes. Use a spatula to stir veggies, then roast for 15 to 20 minutes more, or until fork tender and lightly browned. Set aside. When roasted veggies are done cooking, heat 2 teaspoons olive oil in a large pot over medium heat. Add garlic, ginger, garam masala, and cayenne to pot. Cook, stirring constantly, for about 1 minute. Mix in roasted veggies and vegetable broth; bring to a boil. Remove pot from heat and puree soup until totally smooth using a stick blender (or regular blender). Return soup to heat; stir in coconut milk and lemon juice. When soup is heated through, remove from heat and season to taste with salt and pepper. Serve soup hot, sprinkled with cilantro. Enjoy! This soup is on the thick side. You can thin it out by adding extra broth or coconut milk, if desired. 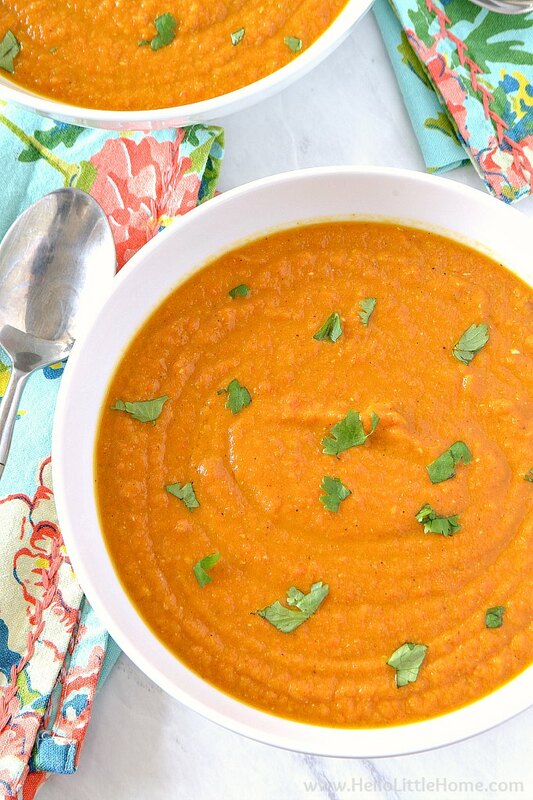 Love this Roasted Carrot Soup and want more? And make sure out my roundups of Vegetarian Spring Recipes and Vegetarian Easter Recipes, too! Looks delicious and healthy. What I liked more is the color of this soup. Thanks, Liz! 🙂 Isn’t that color gorgeous?